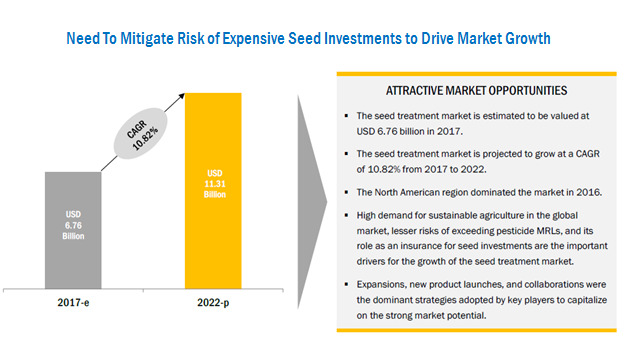 [203 Pages Report] The seed treatment market was valued at USD 6.11 Billion in 2016 and is projected to reach 11.31 Billion by 2022, at a CAGR of 10.82% during the forecast period. The key players have been identified through secondary sources such as the Food and Agriculture Organization (FAO), the US Department of Agriculture (USDA), Eurostat (EU Database), the United States Environmental Protection Agency (EPA), and the Food and Agriculture Organization (FAO), while their market share in respective regions has been determined through both primary and secondary research. 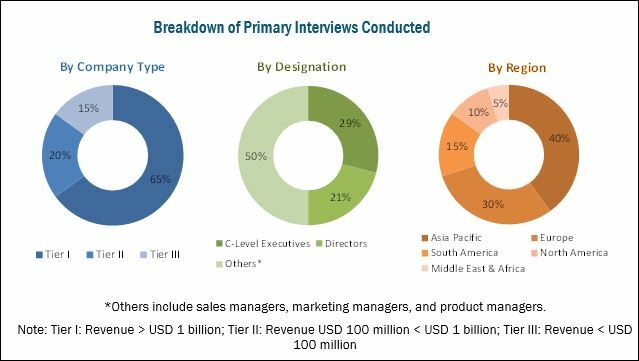 The research methodology includes the study of annual and financial reports of top market players, as well as interviews with industry experts (such as CEOs, VPs, directors, and marketing executives) for key insights (both quantitative and qualitative) for the seed treatment market. The various contributors involved in the value chain of the seed treatment market include raw material suppliers, R&D institutes, seed treatment solutions manufacturing companies such as Bayer, Syngenta, BASF, Monsanto, and government bodies & regulatory associations such as the International Seed Federation (ISF), the American Seed Trade Association (ASTA), and the Pesticide Action Network (PAN). This research report categorizes the global market based on type, function crop type, application technique, and region. Further breakdown of the Rest of European market for seed treatment into the UK, Italy, and Poland. The seed treatment market is projected to grow at a CAGR of 10.82% from USD 6.76 Billion in 2017, to reach USD 11.31 Billion by 2022. Due to the increasing demand for integrated pest management practices to minimize pesticide usage, seed treatment products have been gaining preference for their beneficial characteristics such as the ability to combat early-season diseases and pests and their effect on crop yield. On the basis of type, the chemical seed treatment segment is estimated to account for a larger share of the market in 2017, due to the increasing demand for insecticides especially neonicotinoids and fungicides for seed treatment solutions. On the basis of crop type, the oilseeds & pulses segment is projected to grow at the highest CAGR during the forecast period. This can be attributed to the growth in demand for oilseeds such as canola, soybean, and sunflower across the globe in the fuel and feed industries owing to which highly efficient agricultural inputs are being sought by farmers. Also, due to the high prices of GM cotton, farmers are inclining towards the adoption of treated cotton seeds in Asia Pacific countries to avoid crop failure due to fungal diseases and manage their investment risks. On the basis of function, the seed protection segment accounted for the largest market share in 2016, due to the increased demand for efficient crop protection pesticides among farmers for their effective results and limited crop losses from pest attacks. However, there is an increasing awareness of the toxic effects associated with chemical pesticides, owing to which manufacturers are developing biopesticides for seed treatment purposes. The American region accounted for the highest adoption of seed treatment in 2016, majorly contributed by countries such as the US, Brazil, and Canada. The high adoption of insecticide seed treatment for corn, soybeans, and canola in these countries are the major reasons for their dominance in the market. Asia Pacific is projected to be the fastest-growing market for seed treatment in agricultural applications from 2017 to 2022. The significant growth in adoption of biologicals strengthened the market potential for local manufacturers to develop better and more efficient products such as biostimulants and biofertilizers. 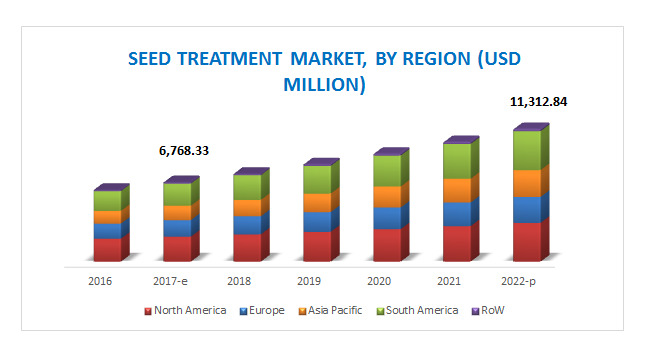 The seed treatment market has been evolving in developing regions with key manufacturers involved in the research and development of better, non-toxic, and non-chemical alternatives to pesticides. The popularity of these products depends on the understanding of their constituents and benefits among farmers. Owing to the awareness about the effectiveness of these pesticides, companies develop them as easy-to-apply products for agricultural purposes. The rise in the number of instances where the development of insecticide resistance among pests has been witnessed as a challenge for the growth of this market. Key players identified in the seed treatment market include Bayer (Germany), Monsanto (US), Syngenta (Switzerland), BASF (Germany), Dow AgroSciences (US), DuPont (US), FMC (US), Sumitomo Chemical (Japan), Arysta LifeScience (US), Incotec (Netherlands), Nufarm (Australia), UPL (India), and Germains (UK), as these are well-established and financially stable players that have been operating in the industry for several years. Most key participants have been exploring new regions through expansions, acquisitions, new product developments, and joint ventures across the globe to avail a competitive advantage through combined synergies.